The Pre-Raphaelite Brotherhood was a nineteenth-century Cosplay meet-up who painted scenes from the Bible set in lush English vicarage gardens. They were also fond of Shakespearean women drowning in a river or drifting around aimlessly in boats. Luxuriant hair was very important to the Pre-Raphaelites, especially luxuriant auburn hair cascading around the shoulders. 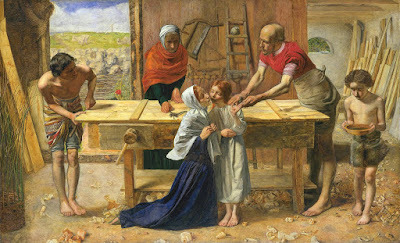 Doomed lovers and Biblical figures with big hair appear in most of the Brotherhood's paintings, making The Infant Christ Rebuking His Neighbor For Operating A Table Saw Before Noon On The Sabbath particularly interesting as Millais' picture is only Pre-Raphaelite work to include a bald man.